In an attempt to foster innovation and young aspiring masterminds in technology fields, Vodafone sent an open invitation to Egyptian software developers to join their Hackathon that took place from the 13th to the 15th of December. The competition, that took place at Vodafone HQ Smart Village, was a unique platform for youth to present new innovative ideas and initiatives to enable digitalization in specialized sectors in the country. Participants, forming teams of 2-5 members, submitted ideas that tackle various issues; be it robotics, application development, AI, you name it! Developers, programmers, tech enthusiasts, who are graduates and under-grads studying Computer Science and Engineering, and more applied for the challenging competition. Vodafone filtered applications submitted by 300+ teams and qualified 44 teams to join the 3-day competition. Out of which, 10 were qualified for the final panel. Each of the three lucky winning teams submitted ideas with great potential. ParaZtec that of the team that came in 3rd, is a 3-part system that aims to help alleviate obstacles for people with communication hardships; mainly Paralysis and Multiple Sclerosis patients. What’s quite impressive about that one is that all team members; Mazen Kazem Mahmoud, Mahmoud Adel Mohamed, Ahmed Haris Ibrahim, and Mohamed Ayman who are all high school seniors! Founded by Salma Medhat, Ahmed Hisham, Ahmed Zaki, Amr Ahmed and Mohamed Hussein “Robabikya” which Vodafone suggested to be given the name ‘Bikya’ instead, came in 2nd. It’s a waste management mobile application that allows users to trade their trash for cash, discounts on online shopping platforms, or other services. The first place went to Helpee, a team that encompasses 4 members including; Sara Mahmoud, Abdelrahman El-Shobragy, Anwar Aly, and Aya El-Kader. The 4-person team innovated a platform that connects people with disabilities and volunteers who want to help them with simple daily tasks. Volunteering can be either paid if it’s an urgent request for help or free of charge. During the event, the platform was best described as an uber-like platform for volunteers to help people with disabilities in the community. 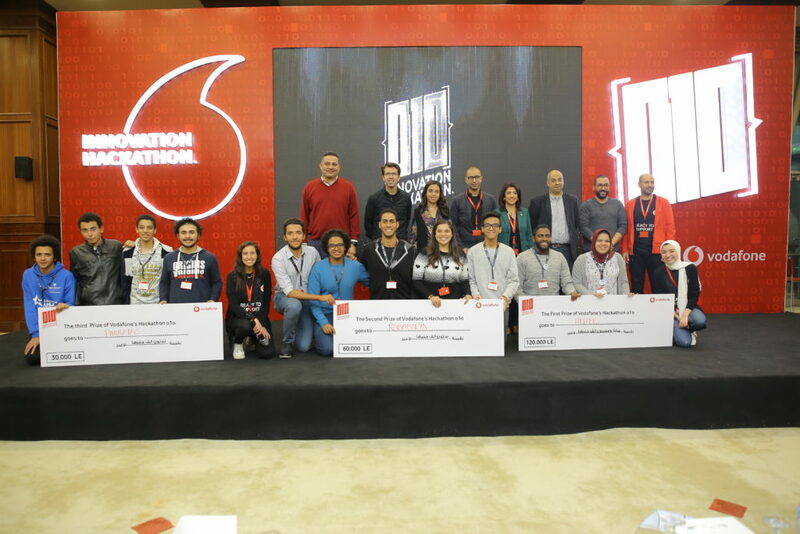 Winners were granted valuable monetary prizes from Vodafone worth EGP 30,000, EGP 60,000, and EGP 120,000 respectively as well as Nanodegree Scholarships from Udacity. The judging panel included Alexandre Froment-Curtil, Vodafone Egypt CEO; Mohamed Adbdallah, Enterprise Business Unit Director; Emad AlAzhary, Strategy Director; Karim Eid, C. Marketing Digital Director; and Amani Rabei, Vodafone Shared Services Director. Those in addition to Maha Rashad, CEO ITIDA, and Head of Technology Shared Services Egypt, Eng. Mohamed Sami. WE SAID THIS: Congratulations to the winners! For those who missed this opportunity, stay tuned for the next one!